It is the space between Kralja Milana, Beogradska, Makenzijeva, Svetosavska, Bulevar oslobođenja, Deligradska and Nemanjina streets. 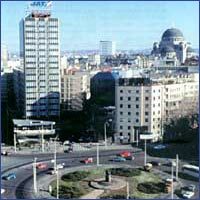 Until the 1880s this square was only a large pool where the inhabitants of Belgrade went hunting wild ducks. The formation of the square started when an Englishman, Francis Mackenzie, a well-known businessman, bought a large piece of land above the present square and parcelled it for sale. Soon after that, Mackenzie has built a house for himself at Slavija (at the place where the old "Slavija" cinema used to be), which in 1910 was turned into the Socialist People's Center, a gathering place of the worker's movement. The other, smaller buildings at the corner of Kralja Milana and the square, in which the famous cafes "Tri seljaka" and "Rudničanin" used to be, were destroyed before and during World War II. A modern hotel named "Slavija" was built in 1962, and enlarged later. For some time, the square used to bear the name of the prominent leader of the Socialist movement in Serbia, Dimitrije Tucović, while the monument dedicated to him still stands in the center of the square.